Johannesburg was the focal point of the world today when the World Cup finally began. 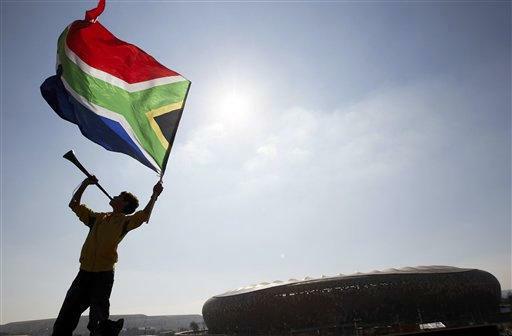 The day had not begun in the celebratory way the South African people would have wanted it, with the tragic news of the death of Nelson Mandela’s great-granddaughter after a car crash. However, despite the morning’s events, Soccer City was ready, and with a burst of colour the opening ceremony began and prepared the world for a month of great football. The hosts began with a tricky tie against Mexico, a team that recently showed England at Wembley that they liked to attack, but also that they were prone to defensive lapses. However, opening matches of World Cup tournaments have rarely been high scoring affairs, so it was hard to know what to expect. The game began with Mexico probably the better team. Tottenham’s Giovanni Dos Santos seemed the liveliest player on the pitch, twisting and turning his way through the South African defence regularly, making room for a shot or looking for a team mate. But a combination of poor finishing and good goalkeeping meant that at half time, despite a late resurgence from the home team, the match was goalless. The second half began and although South Africa certainly showed more determination than the first half, Mexico were still the better team. Ten minutes into the half, though, South Africa broke, and a combination of neat passes sent through the speedy winger Siphiwe Tshabalala, and doing his best to take the net off, his rocket shot flew past Mexico keeper Perez and into the top corner. The rest of the match became a fairly tepid affair, until with twelve minutes remaining on the clock, a defensive mishap by a South African defender played Rafael Marquez onside and the centre back made no mistake slotting past Khune in the South African goal. Katlego Mphela should have won it late on but the South Africa striker’s shot came back off the post. So the match ended 1-1, with both teams probably accepting a point as a fair result. France suffered a very poor qualifying campaign, only managing to qualify for the Finals with Thierry Henry’s ‘helping hand’ against Ireland. So it would be interesting to see how they coped against group outsiders Uruguay, who despite not being one of the favourites to progress from the group stages, did possess a productive strike force of Forlan and Suarez, two players who have been scoring for fun in their respective leagues. The omission of Henry and Florent Malouda from the French starting eleven raised a few eyebrows, even more so when the man playing the role Malouda might have played, Sidney Govou, failed to convert a Frank Ribery cross when really he should have scored. That was probably the closest either team got to scoring all night, despite the introduction later of Malouda and Henry. Uruguay tried to make inroads through the French defence, but were somewhat lacking, like Mexico earlier, with their finishing. France’s push for a winner late on was aided by the sending off of Uruguay substitute Lodeiro, but still they failed to create any chances. A very poor match in truth with neither team causing the opposing keeper any serious trouble, but Group A could be a very interesting group. Any of the four teams could realistically qualify and it probably will come down to the last round of group matches.